Number One Chinese Restaurant is a fascinating look at one Chinese restaurant – the focal point of our character’s lives. It is a character driven novel that focuses on the different ways our lives are wrapped around this fulcrum. Number One Chinese Restaurant is heavily character driven in the best way. Because we can see the thoughts and dreams of all the characters it is almost looking behind all these windows. There are multiple layers of love stories, families, and revenge. The protagonists are lively and dynamic. They take you into their lives and you quickly begin to understand their desires and fears. This complex book lets you encounter multiple characters entangled in an intricate dance around one restaurant. Their lives revolve around that one focal point and as the story enfolds as we not only find out what they are doing now, but what lead up to this moment. Li is a truly gifted character artist that places our heroes, and maybe also anti-heroes, into the right moment. The tension is palatable and there are all these forces and threads coming together. 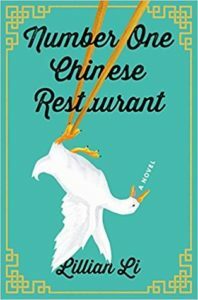 If you’re into diverse fiction, family stories, and character driven books, Number One Chinese Restaurant is for you. Check it out on Goodreads. Best family driven story – go!